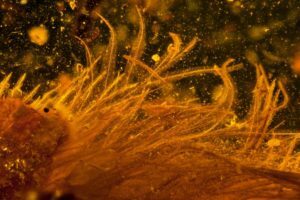 Last week, a new [discovery] made headlines – a bird tail preserved in amber. 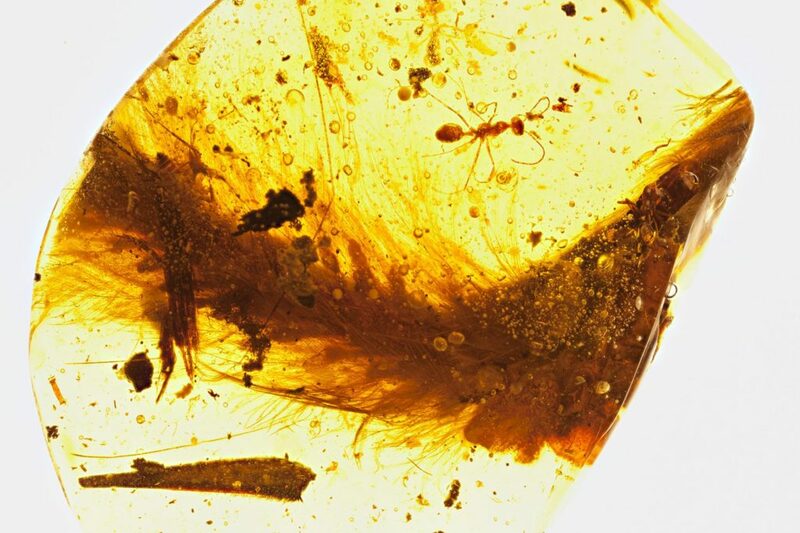 You may remember that in July I talked about a pair of bird wings [trapped in amber]. 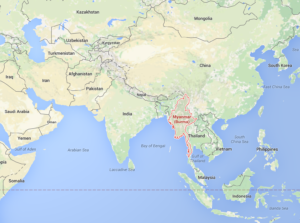 This specimen comes from the same country, Myanmar, and is from the mid-cretaceous (around 99 million years ago). The specimen. By R.C. McKeller and the Royal Saskatchewan Museum. 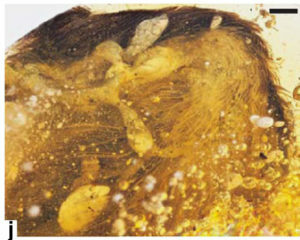 The specimen is a partial tail. 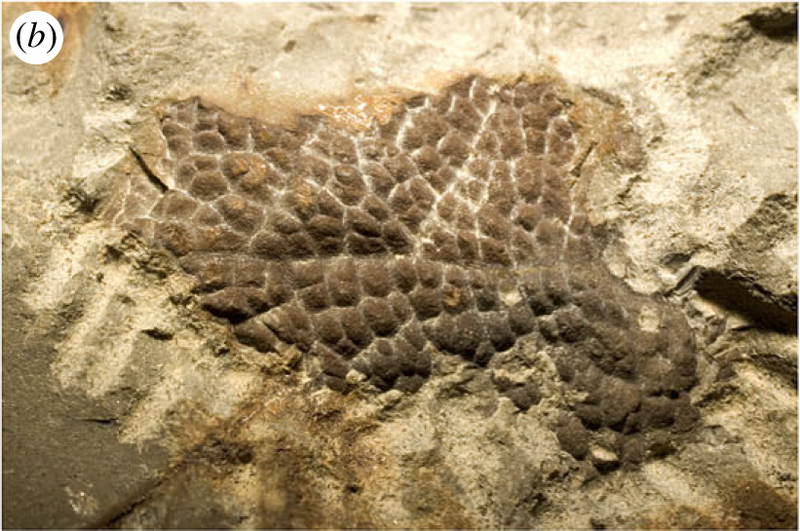 It has an estimated 8 full vertebrae and one partial one and because of their shapes, the authors think that these are from the middle or end portion of the tail. Their shapes also indicate that the tail may have had more than 25 vertebrae total. 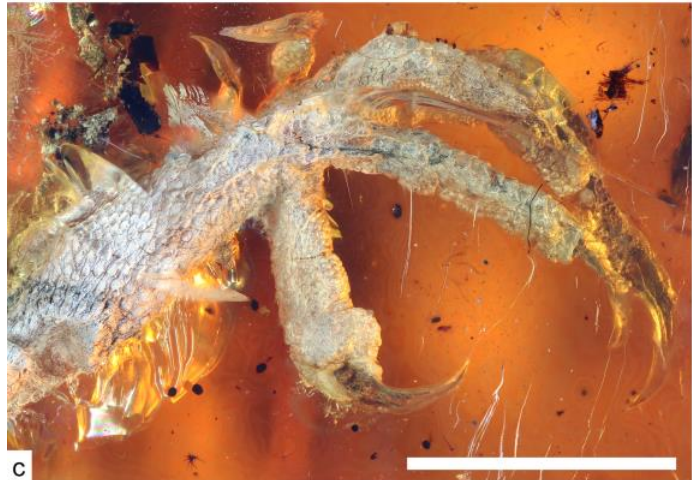 The whole tail specimen is only around 35 mm long, so they think it was a juvenile. Figure 1E from the paper showing the CT scan of the vertebrae. Modern birds and their closest extinct relatives have short tails and pygostyles. A pygostyle is a fused section of tail vertebrae that support the tail feathers. 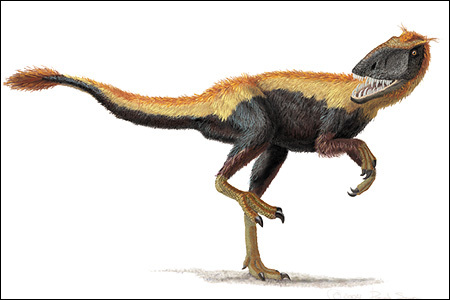 Because this new specimen has a long tail, we know that it belonged to a non-avian coelurosaur. 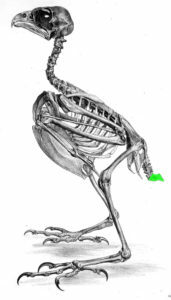 A bird skeleton (Peregrine falcon) showing the pygostyle in green. By Eyton 1867. Let’s detour for a moment and talk about feathers. Modern bird feathers have an assortment of shapes and functions. Down feathers, what baby birds are initially covered with, have tufts of rami (ramus – singular, means ‘branch’) that are used to insulate the bird. As the bird grows, it develops body feathers. These are symmetrical. 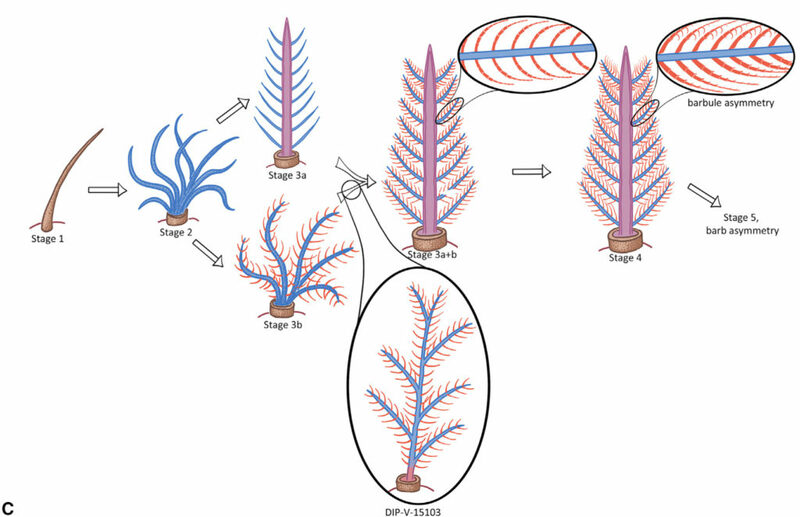 They have a central shaft (called a rachis), and branching rami on each side. Each ramus has barbules (little hooks), and each barbule has little hooks so that the rami can stick together, like Velcro. We have specimens of dinosaurs that show each of these stages, and we know how feathers grow in living birds, so we understand their evolution and development very well. 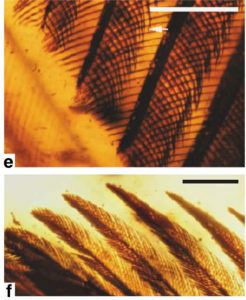 Figure 4c from the paper showing feather development. Blue is barbs, purple is the rachis, red is the barbules. The circled one is what the new specimen has. 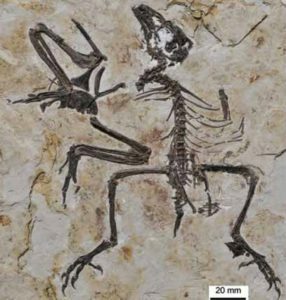 This specimen has feathers with a short rachis, a central ramus with branches, and branches with barbules. Not quite a modern feather, but not a very simple feather either. It’s intermediate. 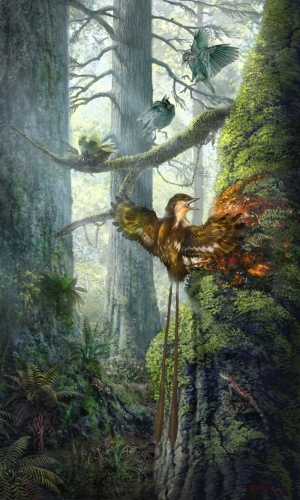 If the whole tail had these feathers, though, the authors do not think this animal would have been able to fly. The feathers are darker on the top of the tail (probably a chestnut brown) and white or pale on the bottom of the tail. A closeup of the feathers of the specimen. Photo by L. Xing. 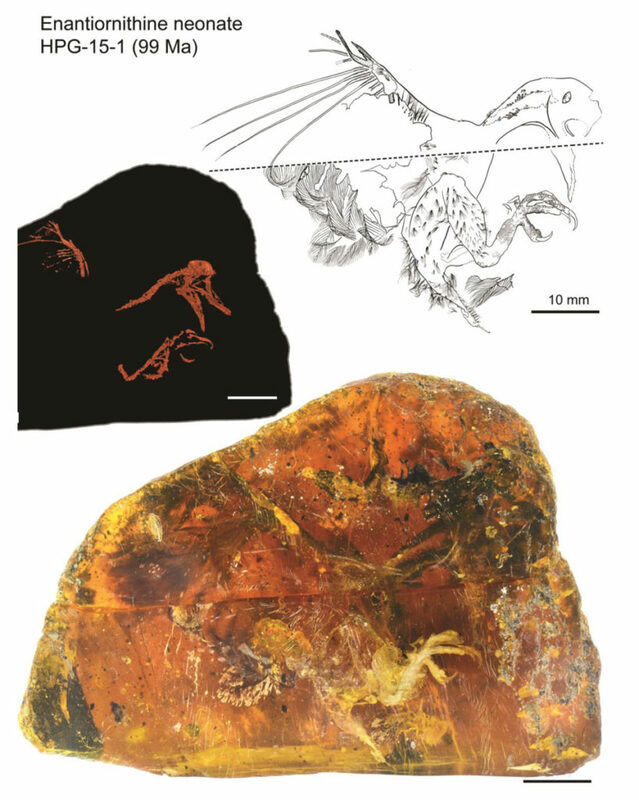 Altogether, this specimen represents a juvenile coelurosaur, with adult feathers, that probably could not fly. 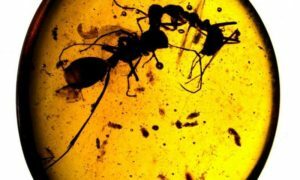 Hopefully we will continue to find specimens in amber so that we can better understand these dinosaurs from Myanmar.